Last Wednesday, our instructors sent us out to gather some sound to refresh us on how to put together an audio piece. Anytime you gather audio, you look like a fool. It’s a given. Especially when a skateboarder skids by you and there you are running alongside him with your mic pointed at the ground. I’m sure the visual I just created in your head was fantastic. Anyways, the skateboarder just smiled and continued on his way. Most students here, especially when you’re around the journalism school, just know. They understand and many of them are willing to help you out. Did you notice the nat pop I used of the coins being dropped in the parking meter? I also used the sound of cars driving by under the interview. I did this to place you in the environment of the story. I did the same thing using the sound of the skate board. I also used it as a natural break in the second interview. Good audio makes up for bad video. I definitely think this workshop was a good reminder of that, especially since lately we have been spending a majority of our time working on putting together video. It’s easy to forget about audio when you’re constantly thinking about framing and shot sequences. In addition, with video you have to plan out what video you need to put your piece together before you go out to gather it. With audio, however, you gather whatever sound you can and then using that audio determine how you want to put your piece together. Sure, I got a lot of sound I did not use, but the more the merrier! That’s all I got for you this week. I’m still chugging away on my final project. Stay tuned. This past week my class and I got to practice putting together different sequences. Practice makes perfect! We had three different stations, which are demonstrated in the video below. Nothing like spending your Wednesday afternoon in class reading children’s books and practicing videography skills! I took out the sound because the classroom setting was too distracting. So last Friday I got the chance to interview country artist Maggie Rose for MUTV’s E23. Little did I know that the battery I grabbed from the “fully charged” slot had 4 minutes left. Luckily, I had a grip tight on me that I borrowed from my final project partner and was able to use my phone to record the interview. The grip tight allows you to mount your phone to a tripod. This isn’t the first time I have had to use my phone during a celebrity interview. Back in freshman year, the exec for MUTV at the time forgot to give me a battery and I had to use my iPhone for my interview with Tech N9ne, which by the way now has over 8,000 views on YouTube. You can definitely tell my video and interview skills have improved from the two different interviews, which are below. My partner that helped me with the Maggie Rose interview was very skeptical about using my phone for the interview. Thanks to this class I was able to convince her it would be okay. There were definitely pros and cons to using the iPhone. By the time the interview was done and the concert started at only 20% battery left. I was very lucky to go into the interview with a fully charged phone. I was also only permitted to record the first 60 seconds of the first two songs. I was worried about how the footage would turn out being in a dark place. It turned out fine as you can see, but I was not able to make any sequences or getting any up close footage. We were also very lucky to have a well lit and quiet room to do the interview, since I was using the native mic. Another really cool thing about the interview was that Maggie’s tour manger pre-approved my questions and told me “I’ve been doing this for a long time and out of a 10, I give you a 9.” The questions I asked definitely earned me the respect from both the tour manager and Maggie and also gave way to some very interesting and in-depth responses. The tour manger used to work for Jason Aldean and is now touring with Maggie to help promote her for the same pay (which is not cheap). They see a lot of potential in her and I agree, that girl can sing. It was an awesome night to say the least, plus I got VIP tickets and free roasted chicken and potatoes backstage! 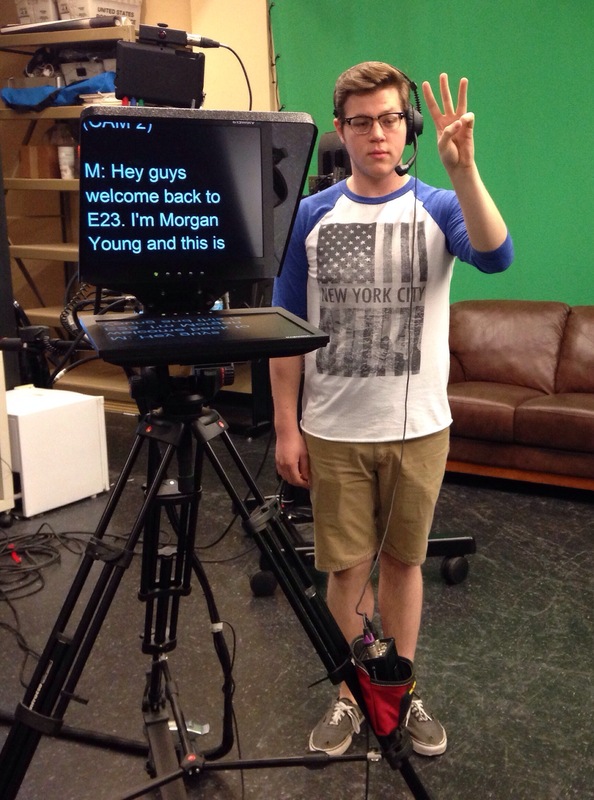 Scene-Setter Shot: E23 staff member, Chris Green, floor directs MUTV’s entertainment show Thursday, Apr. 10, 2014 in Columbia, Mo. 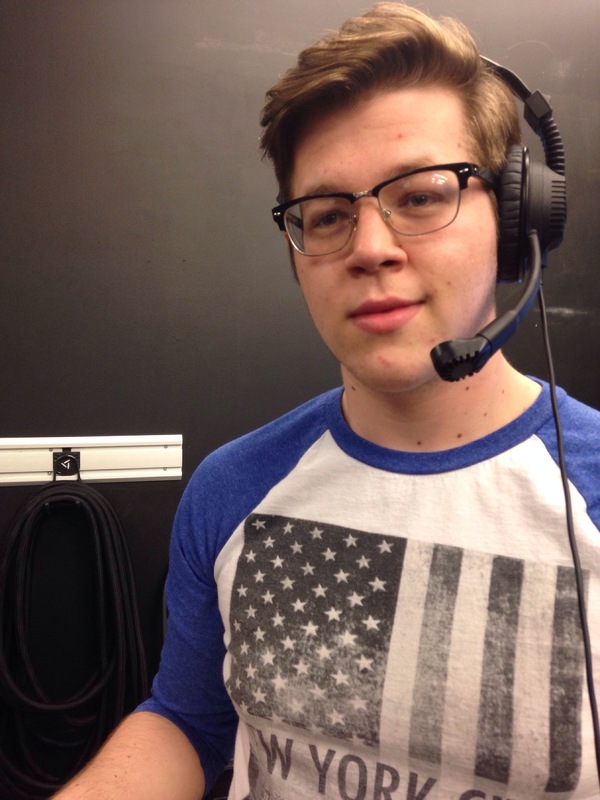 He is one of many students gaining real life experience producing a weekly show that covers entertainment news and cultural news about the University of Missouri, the City of Columbia, and the nation. His main job is to make sure the anchors at the desk know what camera to look at. 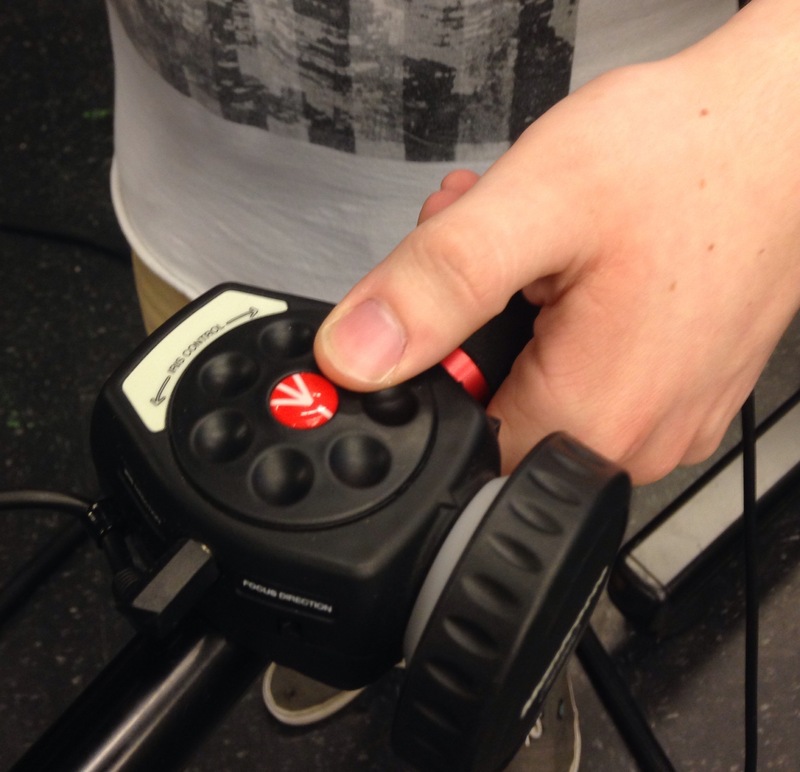 Detail Shot: E23 staff member, Chris Green, adjusts the camera’s iris before filming MUTV’s entertainment show Thursday, Apr. 10, 2014 in Columbia, Mo. The iris controls the amount of light coming through the lens and when the iris is not adjusted properly the anchors at the desk may look washed-out or too dark on screen. Portrait Shot: E23 staff member, Chris Green, adjusts the camera’s position before filming MUTV’s entertainment show Thursday, Apr. 10, 2014 in Columbia, Mo. The headset he wore allowed the people in the control room to communicate with him about various things, such as where the camera should be placed. Interactive Panoramic: Below is a link to a 360 panorama of the MUTV Studio , which is where filming takes place each week. Interactive Photo using ThingLink: Below is picture of the MUTV Control Room, which is where everything that happens during production behind the scenes takes place. ThingLink allows you to embed additional photos, text, and illustrative video. So today in class we got to go out and experiment with the apps we will be using for our next assignment: 360 Panorama and ThingLink. It was a lot of fun given how nice it was. We did, however, get some funny looks as our class raided the quad with our tripods and iPads in hand. Oh well, I think I’m used the looks now… well think is a key word. Anyways, I really wish I knew about 360 Panorama when I studied abroad because it would have given the people back a home a better sense of where I was. I shot the following panoramas with my iPhone attached to the tripod. The first one was shot standing between Jesse and the Mizzou Columns. You’ll also notice some other journalism nerds doing the same thing as me. This next panorama was shot standing in front of the Columns with the road leading downtown Columbia directly across from them. I haven’t figured out how to embed 360 Panorama into my blog, so my apologies. Well, I posted the embedded link for ThingLink… and it didn’t work like it should. I think technology hates me sometimes. Oh well, I just posted the link. So here you go! I hope you enjoyed my experimental work!